The hills are truly alive with the sound of music here. That, and huge pretzels. Yet again my heart has been stolen by a city. 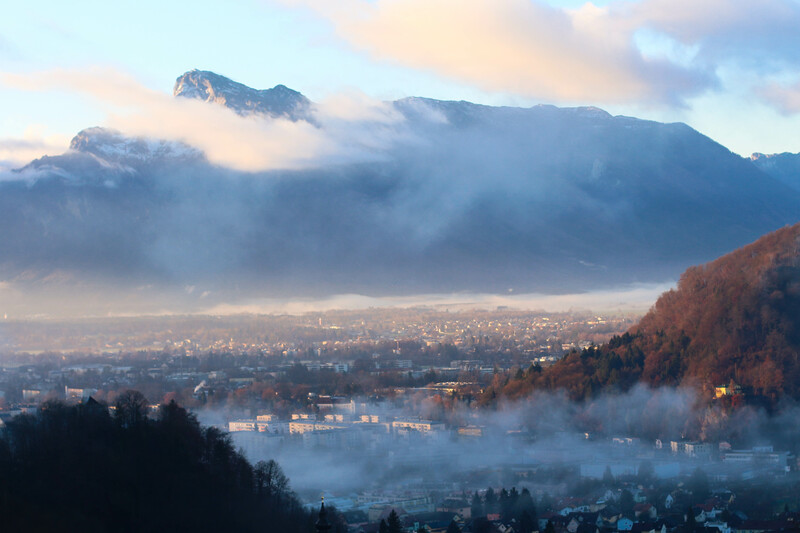 Castles, cathedrals, and the Austrian Alps in the skyline aren’t something you see every day. This city is so captivating and intriguing. Ben and I stayed up in a little guest house on top of hill that overlooks the city. The view we woke up to is not too shabby let me tell you. After breakfast in the cabinesque room, we headed to the city center, Mirabellplatz. Here we found the Mirabellgardens. I can’t imagine how lovely it is in the spring! Then we wandered over the bridge to the Old Town of Salzburg where it was streets of dreams and Christmas markets galore! Christmas markets are simply the best. They give you the whole warm and fuzzy feeling. Everyone is bustling around with a warm beverage in hand as the sounds of Christmas carols (often sung by real live carolers!) play in the background. Lights are strung above and all the stands are situated around the largest of trees letting it shine and glisten in all its glory. A happy place indeed. I could stare at this view for quite some time (unless the bitter cold starts to kick in). The fortress and tops of buildings are beyond beautiful. The whole fortress concept blows my mind. The history of this city is so intriguing. Ben and I kept a running list of questions that we have vowed to find answers to. Remember that morning view I spoke of? This is it. Right outside of our window! Right outside our little place is the most lovely rolling hills and distant mountain views. Our second day we headed back down to the center with no agenda in mind. As we crossed back over the bridge to the Old Town we found ourselves a playground that then lead to a path high above the city with breathtaking views. We have (almost) mastered the self timer except for the occasional ill-timed sneeze. God bless you, Ben. We headed back down the path towards the city center to find our first Christmas ornament and a sweet treat. Both accomplished. We are still on the hunt for Christmas stockings though. This song had its fair share of time on our little trip. Salzburg, I’m smitten.